Rahul Moondra (right) of Indorama Eleme, is seen here with Sumit Kanodia of the Emerging Africa Infrastructure Fund’s managers, Investec Asset Management. 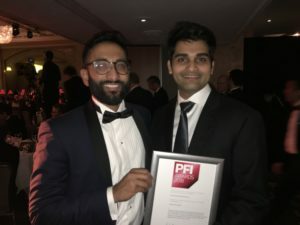 PIDG company, the Emerging Africa Infrastructure Fund (EAIF), has announced that two projects that reached financial close in 2018 have been recognised with awards by PFI Thomson Reuters, one of the world’s leading infrastructure finance and market intelligence publications. The awards go to the Indorama Eleme Fertilizer Project in Nigeria, which won the PetroChemical Deal of the Year in the Middle East and Africa category, and to the Nachtigal Hydro Power Project in Cameroon. It won Multilateral Deal of the Year in the global section of the awards. EAIF announced the financial close of its 11-year US$35 million loan to Indorama Eleme Fertilizer & Chemicals Ltd (IEFCL) in August 2018. The transaction is part of the financing of a US$1.1 billion expansion of the company’s existing fertiliser plant at Port Harcourt, Nigeria. The new plant, which will double the company’s output annually to 2.8 million metric tonnes, is being built alongside the existing facility, which was also built with support from EAIF. Developing the country’s fertiliser manufacturing sector is fundamental to Nigeria’s drive towards self-sufficiency in food production. The Nachtigal hydroelectric plant, which reached financial close on 24th December 2018, will add 30% to Cameroon’s base-load electricity supply. Its clean, renewable energy will help combat climate change and provide reliable power to the country’s households and industry. As a core strategic infrastructure asset it will help strengthen Cameroon’s business investment climate. EAIF is providing a €50 million loan over 18 years to Nachtigal Hydro Power Company, which will operate the facility. In addition to the long-term strategic impact of these projects on the economies of Nigeria and Cameroon, both will produce large numbers of jobs. Together they will deliver 5,330 construction jobs and 750 permanent positions.